Stephanie Ellis is a busy woman of horror. Based in Southampton, United Kingdom, Ellis divides her time as a writer of dark, speculative fiction; as editor of Horror Tree’s weekly ezine, Trembling With Fear; and as co-curator and contributor of The Infernal Clock anthologies. Her latest project, Dark is my Playground, is her solo debut, a collection of dark verse and twisted nursery rhymes released on July 24. Visit https://stephellis.weebly.com/ for more about Ellis and her writing. In an exclusive interview with HorrorAddicts.net, Ellis discusses her new book and the other hats she wears. A favorite website? Horror Tree! Pet peeve? Writing to a deadline and missing out on real life events only for the deadline to be extended when you’ve bust a gut to submit in time. You have one last meal. What do you want to see on that plate? My eldest, Bethan’s, Chilli Mac (vegetarian). Q1: You released Dark is My Playground in July, a collection of dark verse and twisted nursery rhymes. What draws you to the horror genre? ELLIS: The atmosphere and emotion it generates. I’ve never been one for romance novels. I read most of my mum’s Georgette Heyer and Catherine Cookson books when I was about 11 years old, but found I didn’t have the patience for the ‘heroines’ in such books. I like stories with a bit more meat on them, a serious problem to overcome and usually that means something dark. Horror for me is darkness, not gore or gratuitous violence, and I like to read (and write) about what someone would do when confronted with some of their worst fears. How far would a person go to save themselves or someone else? I think horror allows you to explore human emotions and motivation at a deeper level, our baser instincts if you like. Q2: You’re a talented writer who’s been published in numerous anthologies and collections, yet you indicated in your blog that there was a bit of trepidation in releasing Dark is My Playground, your first major solo project. You said that being among a list of other writers in anthologies was a “comfort blanket,” giving you something to hide behind. What were you hiding from? ELLIS: Thank you, that’s kind of you to say but the answer’s easy – fear of failure. Like all writers I have huge bouts of self-doubt, fighting that old ‘imposter syndrome’ on a regular basis. It’s also partly because this is self-published and this means it’s me thinking they’re good enough to be read more widely – but what if I am deluded? I also hate promoting myself and my work, a very British trait. Q3: You obviously love words. In Dark is My Playground, the poems are so beautifully written. I’ve already expressed my admiration for the phrase “bark-womb of the bellied tree,” which you said was inspired by an image. How important are visual prompts to your poetry? ELLIS: Very. I’m one of those people who spent their childhood seeing images in clouds, something I still do and something my own children (now adults) also indulge in. The visual provides a more immediate trigger to an idea and allows my writing to almost become a stream of consciousness without having to think about it. Visual Verse where The Deceiver was first published only allows one hour to write 50 to 500 words and that allows a freedom in writing. No pretence or trying to be clever, I just play with the words. That particular poem is actually my own personal favourite. I look at it sometimes and still can’t believe I wrote it. Old flash competitions, sadly no longer with us, such as Flash Friday and The Angry Hourglass, would use images, and I think what I enjoyed the most was the personification of the inanimate. There was a house in one picture which had one window closed and immediately it brought ideas of eyes and watching to mind, giving me the introduction ‘I have a house. It sleeps with one eye open. Watchful in the wilderness, it keeps me safe.’ The picture gives me the ‘way in’ to a poem or story. Q4: You are also the editor for one of my favorite online features on Horror Tree website called Trembling With Fear, which publishes short stories and drabbles (100-word shorts). With time always being an issue for writers, why do you wear that editorial hat, which must cut in to your writing time? ELLIS: Firstly, because Stuart Conover, editor at Horror Tree, asked for help and as I had achieved much of my publishing success as a result of his submission calls, I figured it was a way of saying thank you. The other part was due to me assessing my future in writing. This last year or so, I decided was the time I was going to take it seriously and not just in terms of trying to get a novel published or extra short stories out there but by becoming more involved in the horror community. Writing is very isolating and with no community as such in my part of the world, it does not feel ‘real.’ By becoming involved with TWF, I’ve made contact with a lot of great writers – yourself included – and I now feel like a ‘proper writer’; I’ve even met a couple of other writers in real life recently and turned online friendships into real ones. In terms of time, I had not expected it to take up as much as it has done, but that’s a result of TWF growing and becoming more well-known. What I also enjoy is coming into contact with writers who say TWF is the first time they’ve ever subbed for publication and I like being able to give feedback and encouragement even if they don’t get selected – pulling them into the ‘family’ if you like, removing a little bit of that isolation we all experience. It’s also great when I see them being published for the first time, and they’re over the moon about it. Actually, a knock-on effect of these demands is a greater focus on my writing time. If I have free time I procrastinate; a deadline or limited time forces me to concentrate … mostly. Editing is something I’ve done a lot of in the past, although as a tech writer/project manager in a technical publications company has also made this aspect easier for me. Q5: Speaking of time, you’re also a co-curator for the time-themed anthologies of The Infernal Clock. Why the time themes and why the passion for this particular project, which is yet another time-consuming demand? ELLIS: The Infernal Clock is something born very much out of friendship, going back to my roots in the FlashDog community. The FlashDogs are a looser pack these days as we are all doing different things but it was effectively an online group of people who competed against each other on flash fiction sites such as FlashFriday, Angry Hourglass, MicroBookends and other places. David Shakes was one of the original members of this group. I became part of it about a year later and we became online friends (and again have met in real life). He had the idea for the first Infernal Clock project, which a large number of FlashDogs submitted to – and then asked for help getting it out. Do you see a pattern forming here? So, I stepped up, we got the first book published (The Infernal Clock) and had some good reviews and then before I knew it we were discussing a follow-up (CalenDark) and now we are in the process of finalising DeadCades, which is due for publication October 1st. This latest anthology includes a number of writers from Horror Tree’s TWF as well as old FlashDog friends, each writing a story set in a particular decade from 1880 to 2020. We have been amazingly lucky to get writer-of-the-moment Vox author Christina Dalcher (who also wrote us a story for CalenDark) to write our foreword and our first long story in the collection is from award-winning author Deborah Sheldon. We also have some great stories from the other contributors, so I have high hopes for this book. The time theme was in keeping with the Infernal Clock name. Shakes muttered something about centuries, but I said no … DeadCades is the last of the time-themed anthologies. It won’t end there though. We have plans for a magazine, but some research and planning is required. We want to make this a paying market, so will be taking our time in sorting out exactly what we want to do with it. Glutton for punishment. Q6: I follow you on Twitter, and I see you are constantly writing, or reading and editing other writers’ submissions, or helping with publication of anthologies … I’m tired just thinking about it. Where does this passion for the written word come from? ELLIS: I have just loved reading. For as long as I can remember I’ve had piles of books around the place. I remember going to town as a child with my Dad to visit the library and being able to leave with a pile of books was wonderful. Growing up in an isolated country pub when your parents work pretty much all day leaves you on your own a lot of the time. I had sisters but you still had to find ways to entertain yourself – no 24-hour or satellite TV or internet then. So reading became my escape. They became movies in my head, and I was able to experience a different reality if only for a while. I still love to read, and sometimes I have to put everything on hold and just read a book from cover-to-cover; it’s almost a physical need in a way. I can’t imagine not reading. Words are amazing; they have so much power whether triggering wars, providing a religious code or instilling an emotion. History can turn on what has been said or written. Q7: How does your family feel about your writing? Outside of advice on fonts, how do they influence or inspire your writing? ELLIS: In the past, I always called my writing ‘scribbling,’ as if it wasn’t something I took seriously, so they didn’t pay too much attention to it. Once I started getting published they took a bit more notice but not too much. Now they are all very supportive, even if they don’t always read what I write! My daughters now give me advice, including what to write about and the range of merchandise it could generate, not to mention being a box set on Netflix. I remember when they read the poem ‘The Darkness is my Playground.’ they were shocked at the violence implied in it. Not something they’ve ever associated with me. I’m the most harmless person you could imagine – but it is nice to shock people sometimes, deliver the unexpected. Q8: You’re from the United Kingdom, but in your role as an editor, you read stories from authors all around the world. Do you notice any differences in style or tone between UK writers and writers from the USA? Have you noticed any writing trends in any countries or regions? ELLIS: Apart from the spellings, I don’t see any real differences. The same topics and tropes appear, and I never approach reading or writing with the idea that we are somehow separate. I think it’s because we are all ‘Westerners’ so we have a lot of common ground. I do have to try and avoid correcting U.S. English at Horror Tree, although I standardise to UK English for Infernal Clock. I have been invited to write a flash piece for an anthology edited by Oleg Hasanov (Russian). This particular publication will include many writers from across the globe including those from Eastern European and Asia, and I’ll be really interested to see what the authors from those areas come up with. Which reminds me, I must get to work on it – and I do have an idea, based on a picture I saw on a van. Q9: What defines success for you as a writer? Is it enough to be published or is success something more? ELLIS: It changes as I go on, e.g., first publication, first contract, first invitation to write, but ultimately success is validation of my writing, knowing that people genuinely enjoy what I write and aren’t just being nice. And yes, I’d love to get my novel published. ELLIS: On a mundane level – daddy long legs. Otherwise it’s water. In my first-ever swimming lesson, I think I must’ve been about 5 or 6, we lined up by the pool and one of the other kids pushed me in the deep end. I can still picture myself underwater and hearing the teacher say, ‘Don’t worry, she’ll get herself out.’ And I did. But lessons from then on saw me down on the shallow end and even now water over my face makes me remember that feeling of suffocation and panic. 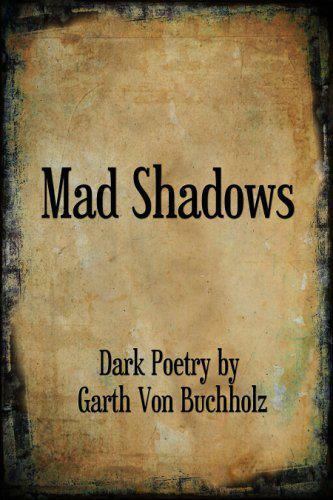 A new collection of dark poetry by Garth Von Buchholz, contributing author of Horror Addicts Guide to Life, is available now.